Solargis releases GHI, DNI and PVOUT maps for Google Earth in kmz format. 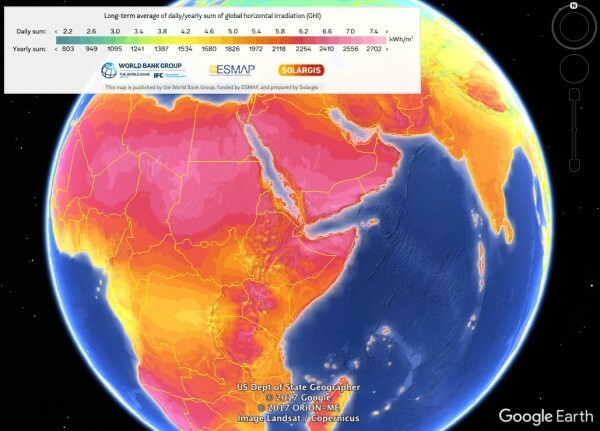 These maps cover the whole world and can be used for fast solar feasibility studies. Maps are available for download from Global Solar Atlas - a mutual project of World Bank Group and Solargis. Map data (e.g. PVOUT, GHI, etc) are served as high-resolution images, provided in a format suitable for viewing and analyzing in Google Earth software. High detail of the maps reveals even very local variability of solar radiation, especially in the areas with complex terrain. Precipitable water or ‘PWAT’ in short, is the depth of water in a column of the atmosphere if all the water in that column were precipitated as rain. We have developed new functionalities of reports that are available now through our climData.